Get Angry with Tater's new Angry Gill Jr FLOATING DESIGN. 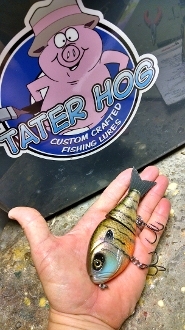 Its 5 1/2 inch profile and 1.5 oz weight is the perfect size to match the hatch for the big old large ones! You can slow roll it and it kicks. You can dead stick twitch it and let it sit. But, Tater's favorite action is Topwater WALK THE HOG. Throw it around bream beds. Rip rap banks, Grass, Stumps, laydowns and docks.